Because my business at the bank in Yuba City was delayed so badly, I was quite late getting up to Dobbins to see my mother, and it was not something I could skip. Besides some semi-annual business I have to do in person with her, I finally gave her the Mother's Day gift card I didn't have back in May. After a relatively brief visit, I set off for home, but by then it was clear that I would never be able to get home in time for the 5 PM Worldcon 76 division heads meeting. Around Kingvale at 4:45 PM, I pulled over and tried to dial in to the meeting on my mobile phone, but while it appeared to connect, I could hear nothing and nobody could hear me, so I gave up and set off again. Coming down the Truckee River canyon approaching the Nevada state line, traffic came to a standstill. There are several places along this stretch of highway where you can pull off the freeway (not at an interchange) and access trails and the river, and I decided I'd make another attempt to get into the meeting, even though it was close to 6 PM. I pulled off the road into the area where other people had also parked, then walked down closer to the river to get away from the noise of the cars on the freeway. 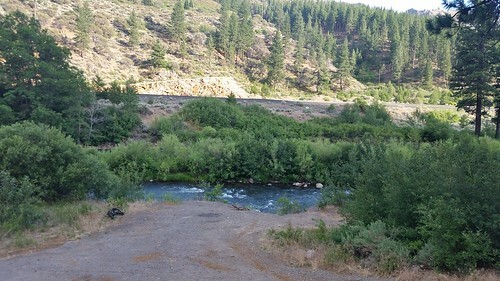 Although I'd hit some showers back in Truckee, it was clear here, and relatively cool and pleasant down by the river. 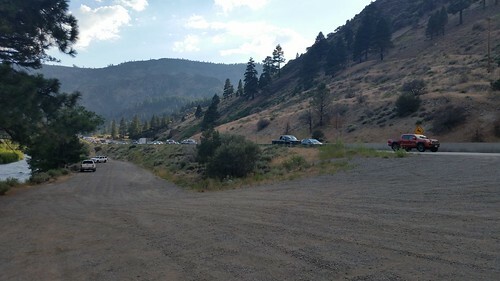 Here's the line of cars stretching back toward Truckee. This was actually a bit lighter than when I bailed. I never did find out what happened. At one point, traffic started moving at speed again, then suddenly slowed to a halt again. Connectivity is hit-and-miss along this section of highway. If you happen to be close to a tower (like at the Agricultural inspection station), you get full strength. Around here, I got 1x signal, good enough for a voice and text connection, but no data, so I couldn't take full advantage of the features of our Zoom conferencing. I did manage to enter the call, and lindadee (who represented WSFS knowing I probably wouldn't be there) was able to help a couple of times when I wanted to speak. I had to send her a text and she would "raise a hand" in the call on my behalf so that the moderator could unmute my line. By the time the call ended, whatever was gumming up the works had cleared and I was able to get going again. Even without the conference call to attend, I might have stopped here anyway. If I must sit around for an hour waiting for traffic to clear, I'd rather have done it here than sitting in traffic. Monsoonal moisture is in the area, and as I approached Reno-Sparks, I saw numerous lightning strikes. I stopped at the Petro in Sparks to use the restroom, getting pretty wet in the process. The rain had stopped as I came out and I took this picture of the storms around me at the time. 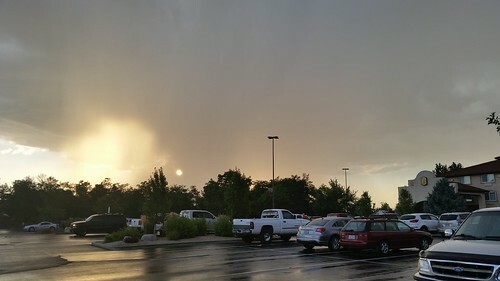 None of the rain in Truckee or Reno-Sparks hit Fernley, which is too bad because it might have settled the dust that was whipping around in the wind when I got home and Lisa helped me get my bags out of the car. OTOH, these storms have a tendency to cause more fires from the lightning than they put out from what rain they do drop, and they sometimes cause localized flooding as we can sometimes get 20% of our annual average 13 cm of rainfall in less than an hour, so maybe that was for the best. Today I did very little. I slept in a bit, had breakfast at the Wigwam, went and bowled a few games, collected the mail, and went home. It was sufficiently hot that I got sleepy again and took a nap for a couple of hours with the swamp cooler pointed at me. Then I tried to catch up on Worldcon and WSFS e-mail that had piled up when I was on the road. It's only a month to go now. Five weeks from today, I'll be getting ready to host the WSFS coverage of the Hugo Awards on CoverItLive. "Days on the calendar are closer than they appear."